The Super Star 1200 Collection is estimated to last an average family 12 to 24 months! 1 - 25 Lb. 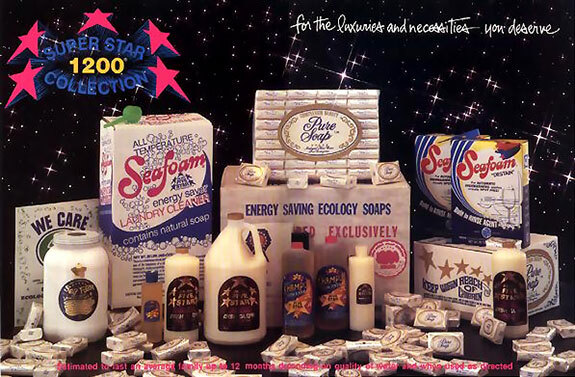 Box (400 ounces) ‘Seafoam’ Laundry Soap Powder. 1 - Gallon Jar (128 ounces ) ‘Seafoam’ Laundry Soap Powder. 2 - Quarts (64 ounces) ‘Five Star’ Shampoo Concentrate. (or, 2-5 Lb. Boxes ‘Destain’ Automatic Dish Granules & Scoop). 2 - Quarts (64 ounces) ‘Seafoam’ Dish Glow Concentrate. 1 - Lock-top Squeeze Bottle ‘Dish Glow’ Dispenser. 1 - Lock-top Squeeze Bottle ‘Shampoo’ Dispenser. 1 - One ounce Laundry Soap Scoop. 1 - 6" X 9" Heavy Duty Pure Nylon Scouring Pad. Complete Instructions - Data Information Bulletins Included.